Coleen's Recipes: GLAZED DONUTS...Live a Little!! This is my "go to" recipe when Hubby asks for homemade donuts. 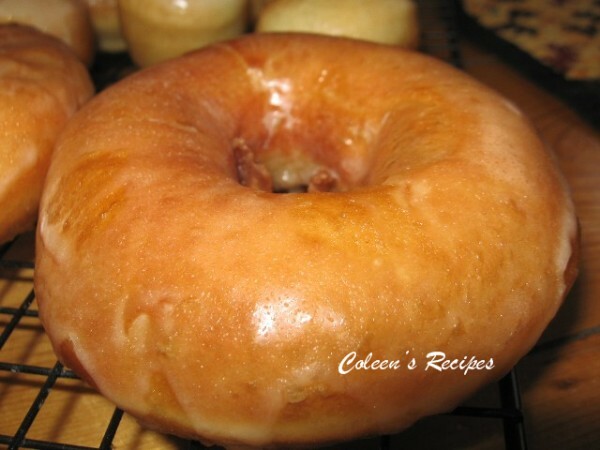 I have tried many, many donut recipes over the years and this is his favorite; it is simple, delicious and it has never failed me. Sprinkle the yeast over the warm water and let it stand for 5 minutes or until foamy. In a stand mixer, mix 2 cups of the flour, milk, sugar, salt, eggs, shortening, and yeast mixture until well mixed (takes just a minute on low speed). Beat in the rest of the flour, ½ cup at a time, until the dough doesn't stick to the sides of the bowl anymore. Once it is at that stage, knead for about 5 minutes. Place the dough in a greased (I use cooking spray) bowl, cover it with plastic wrap and sit it in a very warm part of your kitchen for an hour, or until the dough doubles in size. Turn the dough out onto a floured surface and gently roll it out to ½" thickness. Cut with a floured donut cutter (see note below). Set cut out donuts on a square of parchment paper that you lightly sprayed with cooking spray. This will help you tremendously when it comes time to lift the donuts into the cooking oil. Spray the tops of the donuts with a little cooking spray and cover loosely with plastic wrap for a second rising (takes about 45 minutes to an hour). Heat vegetable oil in a deep fryer (see note below) to 350 (I cooked mine at 375) and gently lower donuts into oil. Fry until they turn nice and golden then flip them. Drained cooked donuts on a baking rack and before they cool all the way down, dip them in a simple sugar glaze (or cinnamon sugar). Mix everything together (starting with 3 tablespoons hot water, then adding the last tablespoon if you need it). NOTE: My donut cutter is a small pineapple can that I've removed the top & bottom from. For the center hole, I use a small circle cookie cutter. NOTE: I heat my oil in an electric frying pan so I can regulate the temperature (and it doesn't take as much oil as a deep fryer). These look amazingly delicious! I can see why you love this recipe. Yum. I am going to have to try these. My husband loves homemade doughnuts. These look delicious, I am going to try them for sure. TFS the recipe. These look a lot like the donuts I make. I also like to fry them in an electric frying pan. You can cook more at a time that way. Thanks again. I have a thing for homemade donuts and I am going to try this recipe. Donuts are always a hit here. "live a little" oh yeah baby!!!! My love for glazed donuts knows no limits. I tried making donuts a while back, ABSOLUTE disaster, LOL. I'm going to have to try this, Coleen. Your recipes are always sooooo GREAT! Beautiful! I've never made donuts, so I obviously don't have a go-to recipe, but if I ever decide to make them, I'll try your recipe. It looks perfect. I tried this recipe today Coleen and these donuts are fantastic! Oh so yummy..someone please come get them so I don't eat them all..
Colleen, I have been a quiet lurker of your blog for sometime. You might claim that your recipes are nothing fancy, but I think they are classic recipes that I would love to taste. I've been MIA on many of my favorite blogs, because of my crazy work schedule. I'm glad I popped in, because the lemon sugar cookies and these doughnuts are queued up for me to make. 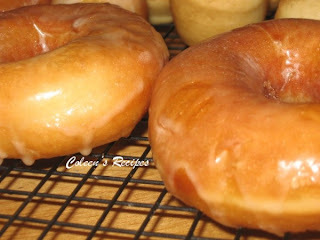 Hubs loves glazed doughnuts and I've never made them. Now, I can, because I trust that this recipe is fool-proof! OMG!! Colleen, as I type, I have already eaten one of these doughnuts. They are light and airy. The glaze is perfect! The dough was easy to make, and rose very quickly. These are wickedly good. These are the first doughnuts I've ever made, and my husband is a very happy man. Thanks for the inspiration. I'll be blogging it as soon as I catch up on other posts, and I'll let you know when I give you a shout.